Phil: Okay, so Heather, can you say, it’s fall bulb planting time? Heather: It’s fall bulb planting time! Phil: That’s perfect. Hey guys, it’s fall bulb planting time, it’s Phil here from smilinggardener.com and my sister and I have teamed up to write this article for you. What we did is we wrote an article on my website. I’ll put, if you are not on my website right now, I’ll put a link down below and that’s the full article. What we are going to do with this video is just really quickly share a few points from that article. So, why don’t you remind people where you live? H: I live in Amsterdam in the Netherlands. Phil: So that’s why we started thinking about this bulb thing, right? H: Yeah, the home of the tulip. Phil: Right. So that’s why we started thinking about this and because it’s fall and it’s time to think about planting, we want to talk about it. So I will ask you first, when should people plant their bulbs, when in the fall? H: Okay, well, that obviously depends on where people live. You want to leave about four to six weeks of above freezing temperatures so that the roots can get established and that is so that in the spring, the root system is already established and they can go right into pretty soon big flowers. Phil: Did you say established twice. H: Aye, twice, really established. Phil: Okay, so I’ll talk just quickly about choosing bulbs. So obviously, when we are talking about planting fall bulbs that means these are bulbs that are going to flower in the spring. So we plant those in the fall. All there is to choosing your bulbs, you want to buy them now in the fall. You don’t want to buy them in the spring and then store them until then. So buy them now, get the biggest bulbs you can. So whatever varieties you are planting, choose the biggest ones from the shelf and just get ones that are healthy and not diseased. That’s basically all there is to it. Then when we get into actually planting them, why don’t you tell them about the location? Why don’t you try to say in Dutch here, a little Dutch saying? H: I am so sorry to anybody who speaks or understands that. Okay, there is a Dutch saying and it’s something like this, it’s like, “bollen houden niet van natte voeten”. I think I am saying that more or less correct. It means bulbs don’t like wet feet. So you want to pick a location that is sunny and most of the time sunny and that has good drainage so you don’t have puddling water beneath them. Phil: And then when it comes to preparing the area, you don’t need — in fact, if you are on my website, I’ll link to a couple of articles. You don’t need bone meal, you don’t need 10-10-10; all you need is to loosening up the soil. If you have some well done compost that’s wonderful to work that in there and then you can either loosen the whole area or just dig your holes where you are going to find your bulbs and you can even dig a little deeper than the bulb is going to go in order to loosen the soil below that. Phil: Speaking of depth, why don’t you tell people how deep to plant them? H: So you want to plant something like three to five times the height of the bulb. 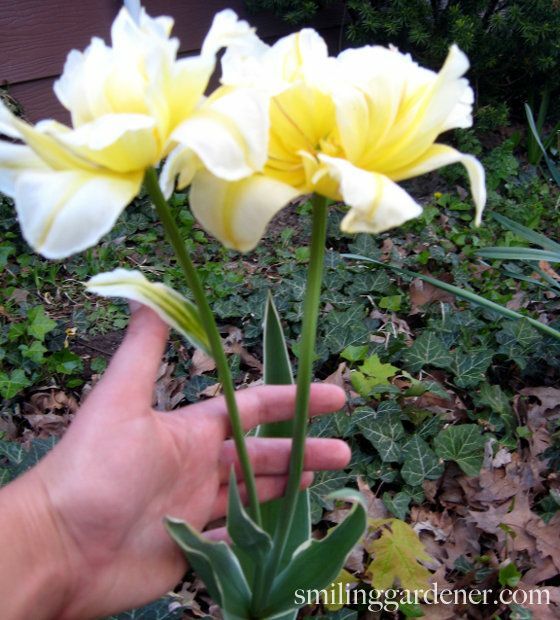 So big bulbs need to generally go a little bit deeper and what you might want to do so that you get kind of a layering effect of blooming is plant some deeper and some more shallow because deeper bulbs are going to bloom later and so that should prolong the flowering time of whatever cropping plant it is. Phil: Why don’t you say maintenance too because there’s not much to do for maintenance, right, after you plant them? H: Yes, there’s really not too much to do. Yeah, after you plant, you give them a good water and Phil, I have a question actually to ask you. H: When you are planting garlic, are you supposed to take off the tunic? Phil: Okay, I did have one other point about keeping squirrels away. So if some people have squirrels or little critters that like to come and steal your freshly planted bulbs, there is a couple of things you can do. One is you can put mulch, sometimes just a couple of inches of mulch will help or if the leaves are all falling, just pile the mulch on top there. And actually, I’ll let people to go to the blog for the other things because I know this video is getting a little bit long. There is a couple of other little things you can do so I’ll leave them hanging. We had a question we want to ask people, right? H: Yes. I was wondering where does everybody live, what’s your climate like and if it’s time for you guys to plant now or do you still have a little bit to wait. Phil: Yeah, because we plant in September, but other people might plant in different months because it’s a different climate, right? Phil: Okay, that is all for today. 1. When To Plant Fall Bulbs. Some bulbs are planted in the fall and others in the spring. Bulbs that flower in spring are planted in the fall, and vice versa. It’s time to start planting fall bulbs when nighttime temperatures are cool but far from freezing. We want the rooting process to begin before the frost comes, so allowing 4-6 weeks of above-freezing temperatures is a good idea. That time-frame allows the roots to establish in the fall so that come spring time, the plant is healthy and can go right into producing big flowers. Like any plant, the types of bulb plants you can grow depends on your climate, so choose accordingly. In the northern U.S. and up into Canada, for example, fall bulb plantings include garlic, other alliums, tulips, and daffodils. There are many other fall bulbs to plant, but be sure to pick bulbs that are happy in your climate so that they’ll naturalize and come back every year. Buy the biggest bulbs of each variety to get the biggest flowers. They should be planted before there’s any growth, so don’t buy them if they’ve already sprouted, and for the most part, don’t buy them on clearance – they probably won’t sprout. The bulbs should also be healthy and disease free. You can store bulbs to plant in fall that you had purchased earlier in the year, but they prefer to be in the ground, so the best idea is to plant them fresh and avoid keeping them out of the ground. If you do need to store them, do so in a cool, dark room. 3. Select The Correct Location With Good Drainage. There’s a saying in Dutch “bollen houden niet van natte voeten” which means bulb plants don’t like wet feet. Choose a location that has good drainage and where water doesn’t puddle. Plant at least a dozen fall bulbs together, as 2 or 3 here and there usually get lost among everything else. If planting garlic, onions or other edible alliums, you can certainly have a dedicated bed, but you can also put them all throughout your organic garden, as most plants like having garlic nearby (not legumes). I have a dedicated area for garlic and I plant a few here and there throughout. 4. Prepare The Area With Compost – No Fertilizer Needed. If you’re planting a group of fall bulbs you can prepare a large area of soil, or for smaller quantities you can dig individual holes with a hand trowel. The most important thing is to loosen compacted soil. You can even do so far below where the bulb will sit. With trees, we don’t’ want to dig deeper than where the tree will sit, but with bulbs, it’s fine. The roots want to be beckoned down by soft, rich soil and not run into a firm floor, so don’t be scared to dig deep. You don’t want to use bone meal or 10-10-10 or any other fertilizer. Well-done compost is all you need, amended into the whole area. Preparing a good seed bed makes a huge difference in the health of your bulbs. 5. Planting Depth Is 3-5 Times The Height Of The Bulb. The depth of your bulbs will depend on what you’re planting. Basically, smaller bulbs are planted fairly shallow and bigger bulbs go deeper, just like with seeds. We go for a depth of 3-5 times the height of the bulb. Most packaged bulbs you purchase should tell you specifically how deep to plant, as well as how wide to space them apart. Deeper plantings will flower later, so if you plant some shallow and some deep, you’ll have a longer bloom period overall. Deeper plantings are also safer from squirrels. Bulbs are planted with the pointy side up and the flat side down. With garlic, you break the bulb into cloves and plant them 1-3 inches deep, again with the pointy end toward the sky. 6. Maintaining Your Planting – Just Water, No Pruning. Once your planting is complete, give it a gentle watering. Since the bulbs aren’t too deep below the surface you don’t need to soak it too much, just enough that the soil gets saturated down to the roots. In temperate climates, autumn often brings cooling rains that will help a lot, but if the skies stay clear, be attentive to your organic garden and continue watering until frost arrives. When they’re done flowering, don’t cut them down. Let the bulb pull the nutrients back into itself and die back naturally. That’s how you get healthy bulbs. 7. Keeping Squirrels Away With Mulch, Wire, Cayenne. To discourage squirrels and other critters from digging up your bulbs, a thick layer of mulch may be sufficient. If your leaves are starting to fall, rake them onto the bulb area for a mulch. You can go 12 inches high if you want. One inch chicken wire laid on the ground is even better, and generously-sprinkled cayenne pepper can scare them away, too. Sometimes, they get the bulbs anyway. They are crafty little dudes. As the temperature cools off where we are, we realize many of you are still in warmer places. Where are you and when will your garlic and other fall bulb planting time begin? Hi Phil,Last year, when I planted my garlic, I put a handful of good compost in each of the planting holes as well as dipping the root end of the clove on mycorrhizal powder, which by he way I got from he Organic Gardeners Pantry. This summer, when I harvested the bulbs, they were massive. I’ve never had such big healthy bulbs ever. Along with the cloves, I will be planting some bulbits I gathered from that harvest, here’s for hoping for another great harvest. That’s awesome Heather! Rather than dipping the root end of the clover in the power, I just sprinkle the powder over all of my cloves at once. I know it would seem less effective, but it works just fine and still doesn’t use much power at all. Ultimate tips i think this is what we all wanted, we come across so many flowers but we don’t know actually that this flower is made by, so nice shared, i will keep the tips in mind, and make eco friendly environment. Hey Phil,I’m loving the videos. I just finished lesson 6, ‘Soil Preperation’, and linked over here. I live in an apartment and am ready to make an easy organic soil mix for potted flowering plants which (hopefully) should not require additional fertilizing. Ideally, it will be slightly acidic. Where we live, there is limited access to gardening supplies and shipping is expensive. The plan is to mix store-bought potting soil (Super Soil brand) at about 60% and worm castings at about 40%. To this I will add a little rock dust and rock phosphorus to help with the flowering stage. My questions are: will this have sufficient nutrients, and would you recommend adding coffee grounds for a little added nitrogen, calcium, and acidity? Thanks, and I’m sorry if this a bit off-topic. & I will be adding the mycorrhizal powder to the soil mixture also! There would be a compost component, but it is difficult to come by here- we are on an island, literally.Plus I want to start very soon and keep the work to a minimum for now.The soil was bought here, but everything else was mail-ordered since I want to avoid the common chemical ferts. If there is anything else which would help and be easy to mail, please let me know (ie a vitamin/amino supplement). I tried some unsulphured molasses on some plants, but we have a problem with the little black ants who aren’t dissuaded by common things like cinnamon or chili powder like other ants. I’m worried about using molasses and finding billions of those little guys the next day again..I will be very interested to see what you think about the coffee in the soil and whether that would inhibit beneficial fungi or microbes? Obviously I’m a beginner; your knowledge is much appreciated. I don’t see why the coffee would inhibit microbes, but as I said, the coffee probably isn’t necessary. That being said, it certainly wouldn’t hurt to use just a little to increase ingredient diversity. Or if you have access to free coffee grounds but not free worm compost, you could use some of that instead of the compost. My favorite broad spectrum fertilizer is ocean water – are you on an island in the ocean? I’m not sure how much to use in potting mix, but maybe 1:50 every time you water (just a guess). You can also buy concentrated ocean water fertilizer. It will take more searching to find free compost or castings here, but we live near the reef. I can just go fill a jug and add it to waterings in the suggested ratio (I might also use a EC/ppm meter). That is the single best tip I have ever read on gardening (hadn’t read your blogs like the 2 best organic ferts when I posted my original question). There’s usually lots of kelp down there too. In fact, your site is loaded with great info (can’t imagine the academy). Now I also understand why proper calcium levels are important- and how to supplement that. Your insights on things like balanced soil, pest control, 10-10-10 vs. broad spectrum ferts are concepts I will always employ in my gardening. Thank you for the personalized reply- this is an excellent site. Thanks Kurt, I’m thrilled when people like you come through who understand what I’m trying to get across. It sounds like a good mix. Coffee grounds shouldn’t be necessary because the compost should be loaded with nitrogen. Assuming you’re talking about used coffee grounds, they’re actually not very acidic. It’s a pervasive myth – most of the acidity goes into the coffee. I’m also not aware of them having much in the way of calcium, but you will want to supply that with calcitic lime or ground oyster shells.